Children ages 0-5 will love this chunky board book series featuring illustrations by Care Bear artist Elena Kucharik. BLESSINGS EVERYWHERE teaches little ones that God brings blessings every day in many ways. GOD MAKES NIGHTTIME TOO encourages children to look forward to nighttime as part of God's plan for them. RAIN OR SHINE affirms God's goodness to us whether it rains or shines. 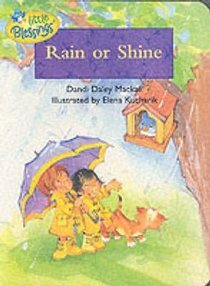 About "Rain Or Shine (Little Blessings Series)"
Shimmering, splashing, crashing praise! Thank you, God, for sunny days! This is a playful, fun-filled rhyme that tells of the wonder of thunder and the simple pleasures of a sunny day.